The all new ARES Full Cassette Folding Arm Awning provides shade protection and decorative elegance to your court yard, balcony or alfresco area. 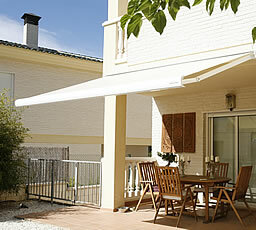 It not only adapts to your way of living but to the architectural style of the property. 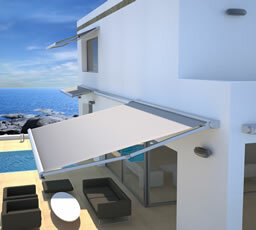 ARES is the latest in slimline cassette folding arm awning that literally comes and goes as you please. We trust the ergonomic and easy to use controls from Enjoy Motors to bring out the Ares folding arm awning and store it to a safe position when the weather dictates. ARES can cover a maximum width of 6 meters and a projection of 3 meters…. larger areas can be covered utilising multiple units. Our quality fabrics are sourced from leading suppliers such as Ricky Richards which provide unsurpassed sun protection, our frame and arms from Gaviota Simabac which are made from a high quality pure aluminium alloy right down to our bolts and screws which are stainless steel. 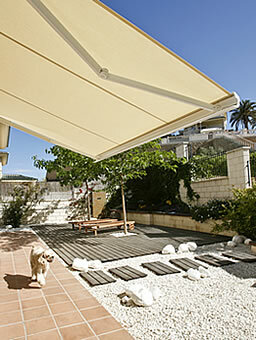 With these factors combined, Croci Australia provided the best quality shading solutions at the right price!